It turns out that at the late year of 2004, we can read of the wood cask history of English and other U.K. breweries. This time, it’s not in the Journal of the Institute of Brewing. It’s not by one of the current beer or beer historical writers, not by a predecessor of the Brewers Association, not in the journal Brewery History. It’s not in the pages of a brewing technology text. It’s not from a publication of the well-known Campaign for Real Ale (CAMRA), although we’re getting warm. It’s in an issue of the quarterly magazine of the fairly obscure Society for the Preservation of Beers From the Wood (SPBW). The SPBW is a U.K. social group founded in 1963 by enthusiasts of naturally-conditioned beer. Originally the group promoted interest in beer that literally poured from wood casks, but today supports traditional (real) ale even if dispensed from metal containers (the main form of container today). You can read the objects of SPBW here and how the group distinguishes itself from CAMRA. In 2004 Anthony Redman wrote up the history of oak barrel use by breweries for SPBW, and most interesting his account is. He also provides an interesting bridge to the present in that it appears he was (may still be) connected to Innis & Gunn, who had recently developed a new type of oak-aged beer in Scotland. His article appears in the SPBW magazine in four parts, in issues 88, 89, 90, and 92. The first part explains how Innis & Gunn Scottish Ale, aged in oak barrels, came onto the market. It’s the familiar story that the beer was meant originally simply to season casks to hold a William Grant whisky, but with some twists and extra background. In a sense the story goes back to the 1970s and early research experience of Russell Sharp, founder of Caledonian Brewery who earlier had worked in distilling. Dougal Sharp, a founder of Innis & Gunn and son of Russell, worked at “Cally’s” as a brewer and came up with the recipe for what is now Innis & Gunn Original. The second part gives some general history on use of oak barrels to hold wine and beer. The third part is the heart of the discussion, with a detailed history of the use of Memel and other oak in U.K. brewing. Some interesting information appears I’ve not read elsewhere, including that Memel wood ceased to be definitively available to British coopers in 1934, on the Persian oak supply that saved British cask plant in the 1950s, and on how the troublesome American oak was dealt with finally by lining the barrels in different ways. Redman writes that Memel came back to the market in the 1950s but was too expensive by then. (Other sources state quality issues arose as well, some of the wood still showed effects of war damage). Redman’s series bears an appropriately Victorian title: Some Animadversions on Beer in Wooden Casks. Here is the page from the SPBW’s website on which past editions of its magazine are archived in pdf. So you can pull any issue mentioned to find each or all parts of the article. Redman gives as well the detailed recipe to season casks, of any provenance, he emphasizes, in the brewery. He takes care to explain this is different from seasoning the staves at the cooperage. It means using a strong salt and soda solution to clear out the woody, vegetal smell of untreated oak, and he says, if you use oak for casks you had better do this else the beer will taste awful. What this shows us among other things is Innis & Gunn were well-aware of how American oak was viewed historically in the British brewing industry. They knew everything we do, and probably lots more. It’s not the case that they thought American oak was a wood typically used for beer casks in the past or was on a par with other woods previously used. Yet, almost all wood used in any form by Innis & Gunn to my knowledge is of American white oak origin. All bourbon barrels and staves certainly would be, but most rum and whisky barrels too, as most other barrels used in the spirits and wine industries. There are some exceptions to be sure, e.g., for Cognac, some French wine, but American oak is the general type used for maturing most spirits and wine today. 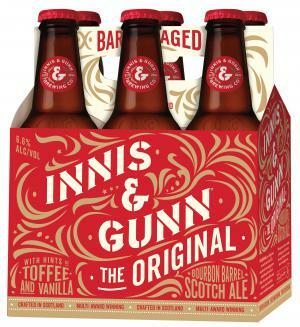 Innis & Gunn clearly made the business decision that a taste formerly not felt suitable for the British market could find new favour. This was probably due to the fact that ale itself had become a smallish category in the beer market: lager was the main form of beer by the 2000s. Also, American craft brewing had introduced a wide range of new flavours in beer. Goose Island and other U.S. brewers had shown by 2004 that beer from American white oak could sell and even have cachet. It has long been reported that William Grant distillery workers liked the beer destined for the rubbish tip after doing its work to season whisky casks. Perhaps I&G went on nothing more than this and a hunch the vanillin-tasting beer would sell. But one thing certain is, I&G clearly understood the history here. They knew they had something novel but turned the old learning on its head, to their advantage. In this sense they really are innovators, just as, say, Fritz Maytag of Anchor Brewing was when he used the new Cascade hop as a top note in his beer in 1975. Anthony Redman obviously was (or is) a well-trained and experienced brewing technologist. He sounds like a scientist or technical consultant, one quite familiar with the literature on beer cask history and then some. He writes well, too. … the drawback of the porosity of wooden casks was resulting in the growing use of steel and aluminium containers. Although more expensive they were particularly useful for carbonated beers, avoiding the loss of gas which was incurred in unlined wood, as well as being more convenient for bulk pasteurised beers. Most other aspects of the brewing process, fermenting vessels etc. had already ceased to use wood in favour of copper, steel or aluminium linings. They were more easily cleaned and required little maintenance. By 1980 wooden casks had all but disappeared. Today beer is delivered in wooden casks by a handful of brewers, notably, Wadworth, T. & R. Theakston and Sam Smith’s. All of them use unlined casks. All of them use oak from Germany and Poland. As was the case 100 years ago, American White Oak, with its tannins, remains unsuitable for unlined casks for English beers. All the Unions at Marston’s, again unlined, are of Polish Oak. A trial Union of American White Oak in 1992 found that it did have an effect on the beer and it was withdrawn. His reference to American oak being unsuitable for English beers may be a subtle reference that a new, Scottish beer, Innis & Gunn Original, aged in a wood most British brewers rejected in earlier days, was about to shake up the beer market. Obs. As documented in our recent posts, brewers in Dunfermline in Scotland had a history of using American oak to hold porter, if not ale. The folk memory is long, even unconsciously we think it can operate in mysterious ways. This may explain the long lapsus for another Scots brewer, Innis & Gunn, to use wood of the same source for its beer.